AS OF 6/2013, NICKY'S THAI KITCHEN IS NO LONGER VEGAN-FRIENDLY. IT USED TO HAVE VEGAN CURRIES, ETC., BUT NOW DOES NOT HAVE GOOD VEGAN OPTIONS. CONSIDER SMILING BANANA LEAF OR SILK ELEPHANT INSTEAD. 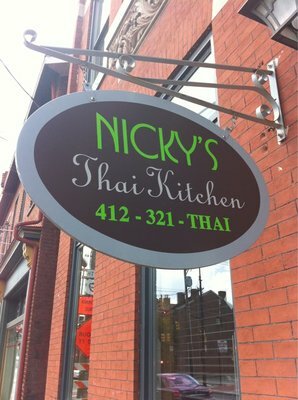 Nicky's Thai Kitchen located on the north side of Pittsburgh has received rave reviews from the Pittsburgh Post-Gazette. The service is good. The atmosphere is friendly. And, most importantly, the food is delish! Nicky's Thai Kitchen has great vegan options like fresh spring rolls, curries and exotic rice noodle dishes. Editor's note" PLEASE call and ask to speak with the owner to find out if the dishes are still vegan. Back in 2011 I could get the curries without the fish sauce. But someone wrote in 2013 that the staff was unsure. I hope Nicky's still is as awesome as it was in 2011, but please do call them to double check before eating there. Let us know what you think about this awesome vegan friendly restaurant: Nicky’s Thai Kitchen – NO LONGER VEGAN-FRIENDLY in Pittsburgh, Pennsylvania. I just got back from Nick’y Thai Kitchen and was informed that the Vegan Duck Curry was made from vegan mock duck, but the curry used isn’t vegan friendly. I was also informed that several veggie dishes still contain fish sauce. The waitstaff seemed to question what was completely vegan friendly so do beware! Thank you so much for letting us know! I was there a few years ago and spoke directly with the owner. At that time he assured me that the dishes were vegan. I’ll amend the post to advise that people double check. It’s really disappointing to hear that it’s gone downhill! Thanks again for letting me know! Definitely not vegan-friendly. I was just there…and I was told (after talking to two different people) that I could order a stir fry…without the sauce. Their curries, their chili pastes, their peanut sauce, etc, etc, etc isn’t vegan-friendly. I was super bummed and didn’t eat but I steer clear of most thai restaurants for this exact reason. Fish sauce is prevalent in the food and I’m not expecting that many options. Their “vegetarian” menu was fish-sauce laden. Amusing since that isn’t very vegetarian. Unfortunately, I checked this website before my family chose this place! I would update it if you can — I went in thinking I could find something. Thank you so much! And I apologize! It really used to be great for vegans. I’ll update the post right now. The chef’s special last week was vegan “duck” in a pineapple curry sauce – SUPER YUM! The food at Nicky’s is fresh and delicious. They can also handle gluten-free diets as well as vegan. Enjoy!